WHY are all the Halloween (and other event) female costumes for purchase always the harlot version of something? Harlot policewoman, harlot nurse, harlot soldier, harlot witch, harlot cheerleader (oops, I repeat myself), harlot nun (! ), harlot teacher, harlot lawyer, harlot fill-in-the-blank. What is up with this nonsense? I can dress as a harlot any day of the week, without having to buy any stupid costume…..um……..never mind. I have a student in my Art class who wants to attend a fine arts college. She is working on her portfolio of work in order to present an impressive portfolio when she makes her application next year. Colleges look for three things: depth, breadth and meaning. Breadth means that you can competently work well with various media, techniques and subjects, not just that you can paint. Depth means that you are developing some focus, or an interest in one area that you are exploring in a series of works, whether that be media, technique or subject. Meaning in artworks is that quality of halting the viewer to consider the work more carefully – a work that is more than just pretty, or pleasing to the eye. 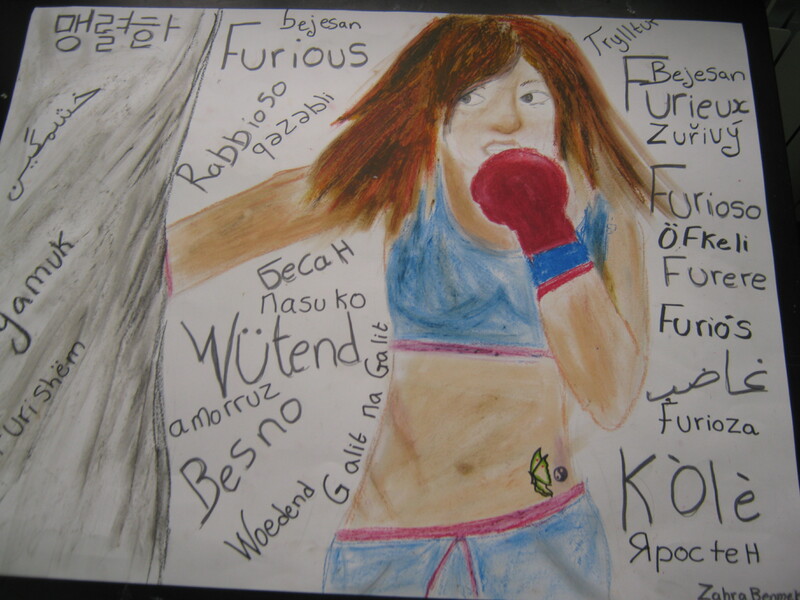 since my student is female, she already has a built-in “meaning” she can explore: feminism. AND, since she has lived for the last number of years in Morocco, an Islamic country, she also has the added cachet of being female in a predominately male-controlled society – feminism meaning bezeft (Arabic for too much, or too many). Hey, if it is handed to you on a platter, use it. So, she and I were brainstorming last week about what works she might could do in this vein. In the middle of the night, I woke up with a brainstorm….OK, a brainfart…..
Take the word “woman.” Look up this word using Google Translate’s languages, and incorporate the word woman in the artwork in the various languages of the world that Google provides – in Arabic script (a, b, c, d,) as well as languages that use other alphabets, like Russian (cyrillic) and others like Chinese, Urdu and so on. The work she created is very good – and it is making me itch to make one of my own!